The music intervals of thirds and sixths are commonly found in classical guitar music of all periods. Here’s why they are so important. The interval of a third is the interval between two notes, two diatonic scale degrees apart: for example, C -E, A – C. A third formed from two whole tones is a major third; one made up of a whole tone and a semitone is a minor third. These music intervals when joined together make up the diatonic triads. For example, the triad A major (A – C# – E) contains the major third A – C# beneath the minor third C# – E. Similarly, the minor triad E minor (E – G – B) is composed of the minor third E – G beneath the major third G -B. The interval of the sixth is produced when a third is inverted at the octave: it is the interval between two notes five diatonic scale degrees apart, for example, E – C, C – A.
Fernando Sor placed enormous importance on the study of these particular intervals. Perhaps this was because the guitar was frequently used to fill out harmonies in ensemble music during the late eighteenth century, an activity otherwise known as playing ‘continuo’. This often involved improvising accompaniments from scores that gave only indications of the basic harmonies to be played. A thorough knowledge of thirds and sixths and where they lie on the guitar would have been invaluable to a performer required to do this kind of playing. This exercise, taken from Sor’s guitar method, is an incredibly inventive study for practising the music intervals of thirds and sixths. In the opening section (bars 1 to 8) the melody predominantly forms intervals of sixths with the bass. The bass line is a simple eighth-note figure rooted around the interval of a third. As always, it is very important to highlight the different voices. Use the ‘m’ finger playing rest stroke for the melody, and ‘p’ and ‘i’ free stroke for the bass to help achieve this. Photograph 1 shows the right hand in preparation to play the opening notes of bar 1: ‘p’ is resting on the 4th string, ‘m’ is on the 2nd and ‘i’ is above the 3rd. Next, ‘p’ plucks the 4th string free stroke, while simultaneously ‘m’ plays the 2nd string using rest stroke (see Photograph 2, which also shows ‘i’ ready to pluck the 3rd string). Photograph 3 shows ‘i’ after completion of free stroke on the 3rd string (note also that ‘p’ has moved back behind the 4th string ready to play its next note). Try playing this on open strings at first, this will enable you to concentrate solely on the right hand rest-stroke/free-stroke combinations. The next section, bars 9 – 16, is based extensively around thirds. The trickiest parts are in bars 10 and 16, where there are some dotted rhythms to negotiate. 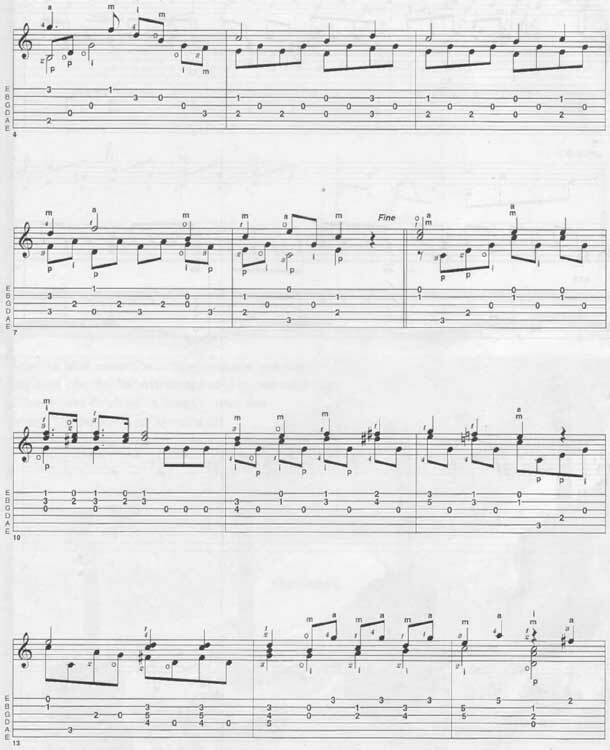 Bar 16 is especially difficult with a double-dotted quarter note on the first beat and a triplet on the last. To make life easier for yourself, prepare as much in advance as possible. As soon as the 4th finger places the G on the 3rd fret of the 1st string, immediately place your 2nd and 1st fingers on F# and F on the 2nd and 1st frets – see Photograph 4. Listen to the track to hear how this leads into the following minor section. Fernando Sor wrote two famous sets of studies, Opus’ 6 and 29, both of which contain pieces exploring these music intervals – study number 12 from the Opus 6 set is a particularly famous study in thirds. He also published several other collections of lessons and exercises that are excellent for beginners. It’s a part of Thirds and Sixths Intervals guitar lesson. © 2012 - 2019 TabsClub Powered by TabsClub 42 queries in 0.274 seconds.